This CellML model runs in both COR and OpenCell and we believe it is close to recreating the original published results. The units have been checked and they are consistent. ABSTRACT: A moderate reduction in coronary blood flow results in decreased myocardial oxygen consumption, accelerated glycolysis, decreased pyruvate oxidation, and lactate accumulation. To quantitatively understand cardiac metabolism during ischemia, we have developed a mechanistic, mathematical model based on biochemical mass balances and reaction kinetics in cardiac cells. By numerical solution of model equations, computer simulations showed the dynamic responses in glucose, fatty acid, glucose-6-phosphate, glycogen, triglyceride, pyruvate, lactate, acetyl-CoA, and free-CoA as well as CO2, O2, phosphocreatine/creatine, nicotinamide adenine dinucleotide (reduced form)/nicotinamide adenine dinucleotide (oxidized form) (NADH/NAD+), and adenosine diphosphate/adenosine triphosphate (ADP/ATP). When myocardial ischemia was simulated by a 60% reduction in coronary blood flow, the model generated myocardial concentrations, uptakes, and fluxes that were consistent with experimental data from in vivo pig studies. After 60 min of ischemia the concentrations of glycogen, phosphocreatine, and ATP were decreased by 60%, 75%, and 50%, respectively. With the onset of ischemia, myocardial lactate concentration increased and the myocardium switched from net consumer to net producer of lactate. Our model predicted a rapid 13-fold increase in NADH/NAD+, but only a twofold increase in the ratio of acetyl-CoA to free-CoA. These findings are consistent with the concept that pyruvate oxidation is inhibited during ischemia partially by the rise in NADH/NAD+. The reaction pathway of the Salem et al. model. 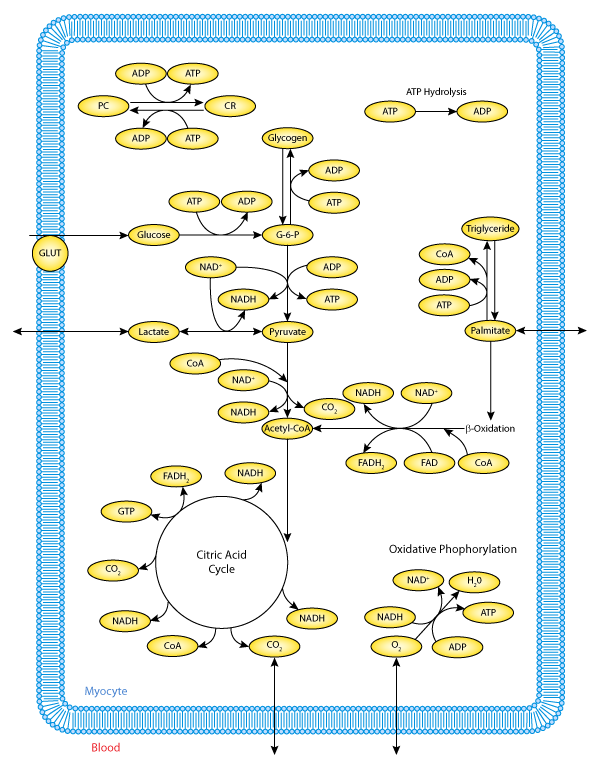 Glucose (through the GLUT transporters), lactate, CO2, O2, and palmitate (fatty acids) are the only species in this model considered to transfer between the blood and myocytes. Derived from workspace Salem, Saidel, Stanley, Cabrera, 2002 at changeset e0281b3b5e99.